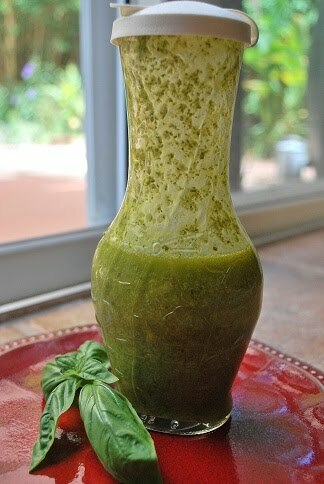 I am in love, love, luuurve with this Basil Vinaigrette recipe I found on Simply Recipes the other day. Like most of you, I have TONS of basil growing in my garden right now, which require frequent harvesting before they get leggy. I boiled up some chopped, golden potatoes and drizzled this green jewel of scrumptiousness over them while they were still warm. Total HEAVEN! Place the salt, sugar, mustard, shallot and basil in a blender or food processor. Pulse several times to combine. Scrape the sides of the blender down with a spatula. Add the vinegar and pulse again. Turn the blender on low and take off the cap in the center of the blender’s lid. Slowly pour in the olive oil. It may sputter a little out of the open cap, so hold you hand over it to minimize splashing. When the olive oil is incorporated, turn off the blender and scrape the sides down one more time. Cover and purée everything for 1-2 minutes. Makes a little more than one cup.